Good morning lovelies. Today i would like to talk a little about the wolf woman within us. 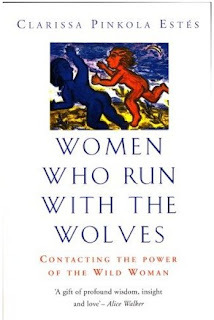 After reading Women Who Run With The Wolves i was hooked on the idea that we all have a wolf woman inside of us purring and waiting in our subconscious ready for us to call upon her. Instead of giving you a detailed description of the book i am going to talk about what the book meant for me as i believe any woman who reads this book will hold a special place for her own individual wolf woman. My wolf woman is silent and beautiful, she is half woman half wolf. She has ancient knowledge and wisdom. The only way i can currently access her is if i sit and close my eyes in a meditative state and start to work through my power points. There will be many versions of power energy sources and mine have Taoism influence. There are three sometimes called Tan Tiens. Firstly above/in my head is a tree, which changes in image from blooming and barren. My tree connects me to knowledge, spirituality and the universe. Secondly are my two butterflies, which i can only feel in essence and never seem to be able to imagine what they look like in my minds eye. My butterflies represent my ability to heal myself and others, they hover and play around my heart. In my center (area where my stomach is) is my wolf woman, she is my action zone and she is extremely strong and wise. With great speed and agility. Sometimes my wolf comes out when i don't expect her to. When i'm anxious or fearful she nuzzles me to gently convince me she will keep me safe. When i'm bathing in hot water and my heart is booming out of my chest i seem to be able to feel her lavishing in the steam with me. I believe every women has a wolf woman inside of her whether she calls it a wolf or not. It can be your strength, your knowledge, your confidence, your inner wisdom, your love. Some time soon i would like you to sit with a warm drink and a straight back in a quiet place. Close your eyes and let the identity of your inner wolf come to you. Be aware she could take any form. Hold the images in mind and let them do whatever they like. Follow you own curiosity and imagination. She will guide, you can observe and sip tea. Getting in touch with your wolf woman can help you access a primal part of yourself. This is a great way to help you feel more connected to your strengths and help you see a bigger picture. So often we can get caught up in our daily lives and it can actually be a relief to kick back and absorb into deeper parts of ourselves. Have fun with your wolf woman and please share with me your experiences. Beautiful description of your Wolf Woman. I'm am in the process of reading the book myself, and am finding it one of the most profound books I have ever read. I am opening up to myself and my own inner wild world more and more with each page that I read. You have a beautiful, sacred space here.